A Croy man has paid tribute to two fellow villagers who didn’t live to see their dream of a sports pitch and pavilion in the area. John McColl, James Hunt and Francis Griffin campaigned for may years for a community sports facility in Croy. 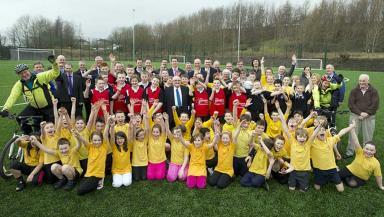 Last month, the dream was finally realised with the opening of the £1million Antonine community sport hub. At the opening, John McColl, the only surviving member of the campaigning trio, remembered the efforts of his fellow villagers. He said: “James, a community councillor for many years, and Francis, who served as a North Lanarkshire councillor, would have been proud to see this magnificent facility open. The sports facility, which features a full-size 3G pitch and a clubhouse, is set to be used by sports clubs and local schools throughout Croy, Cumbernauld and Kilsyth. Francis Griffin’s son Mark, who now serves as a Central Scotland MSP, was also at the opening of the hub. He said: “A sports facility has been long overdue for young people in the area to enjoy. The pitch, which is located near Croy railway station, will accommodate a number of sports, including rugby and football. Stewart Harris, chief executive of Sportscotland, said: “Our aim is to work with local partners to deliver more and better opportunities for people to take part in sport. “We invested more than £435,600 into this project at Croy as we recognised the impact that a well-designed facility could make on the lvies of the local community, providing a home for a number of clubs and sports.